Well done to Adam Murphy Castlebridge who won our internal feile football skills competition this evening and now goes forward to represent the shelmaliers in the county final on Saturday next in the c.o.e ferns along with Luke Roche in hurling.The club would like to wish them both the very best of luck.shels abu. U11s football match tomorrow evening (Wednesday)in Hollymount @ 6:30 v Glynn Barntown. Please be there @ 6:05pm. Well done to the u15 footballers who had a very good win against St. Marys of Maudlintown on a scoreline of 4.09 to 2.09.This was a good hard game of football and the Shels boys had a great team performance and continue to improve with every outing. The boys showed good character and stood up to what our opponents threw at them; they were defiant and finished the game out strongly. The link up play was very good and the most pleasing thing was the work rate. The next game for these boys is away to St. Anne’s in hurling on Thursday night. Brian Malone reaches a staggering 150 competitive appearances with the Wexford senior footballers on Saturday when they take on Laois in the Leinster championship opener at Innovate Wexford Park (6.30p.m.). Having debuted in the summer of 2006 – when starting All-Ireland Qualifiers against Monaghan and Fermanagh – the Shelmaliers’ man has missed only 9 of Wexford’s 158 competitive outings during the intervening years. And he now lies just shy of Colm Morris (160) and David Murphy (157) in terms of appearances by the modern generation of Wexford footballers. 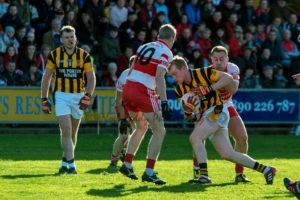 The closest to Brian in the ‘still active’ members are Ben Brosnan (114) and Daithí Waters (89), while Ciarán Lyng, who unfortunately seems to have signed-off from Wexford duty, stands on 114 games during which outings the St. Martin’s gem contributed 17-320. Brian has fired a meagre 0-21 (0-5 in championship) in comparison. But, of course, Brian’s brief under six different Wexford managers has been centred around protection rather than attacking adventure, although his immense versatility means that he additionally serves as a valued link player. 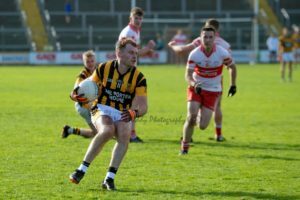 His leadership qualities have even been harnessed by the County Board in recent years as they recruited Brian as a mentor to underage players. That is a role which he was well suited to owing to his duties as a popular teacher in St. Peter’s College, Wexford, where his sporting intelligence shone through last year when he helped guide the St. Peter’s senior footballers to Leinster ‘A’ championship glory and the All-Ireland final. 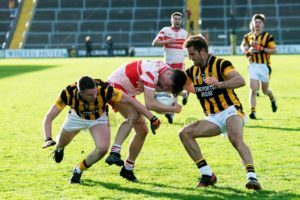 Brian is an undoubted fan favourite, and it is extremely difficult to recall a moment when he disappointed for Wexford. In truth, he never has. 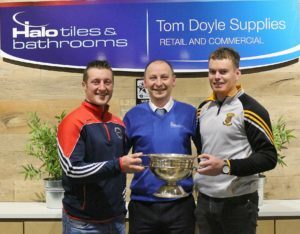 It is such tremendous consistency which has established this player as a mainstay of the Wexford team and a target of various Wexford senior hurling managers over the years. His ongoing involvement with the footballers is particularly crucial during a period of considerable transition for the footballers from the invigorating highs of having contested the All-Ireland semi-final in 2008, Leinster finals of 2008 and 2011, and league finals of 2004 (Division 1), 2008 (winning Division 3) and 2017 (Division 4). Now the torch is slowly but surely been handed to the next generation, with no fewer than 19 players having been handed their National League debuts this year, among them Brian’s younger brother Glen. 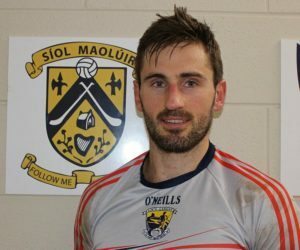 While the footballers first year back in Division 3 started with six losses, finishing on the high of a closing-round win over the division’s eventual outright champions Armagh is something which Brian recently confirmed to Liam Spratt on South East Radio has certainly benefited the younger players in terms of them appreciating that success can be attained through a sustained effort. New manager Paul McLoughlin, a former Kildare star, together with selectors Mark Roche (Kilmore) and Monaghan native Gordon Ward have lots of experience outside of Brian to aid the changeover. 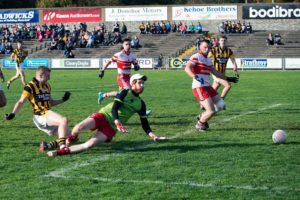 Together with Ben Brosnan and Daithí Waters’ combined 203 appearances, the likes of Conor Carty (59), Tiarnan Rossiter (53), Michael Furlong (50), Jim Rossiter, John Tubritt and Eoghan Nolan (all 33), together with Naomhan Rossiter (29), Paul Curtis (27), Donal Shanley and Syl Byrne (22) all have a strong number of appearances under their belts. And those players have a combined 125 championship outings to their credit too. 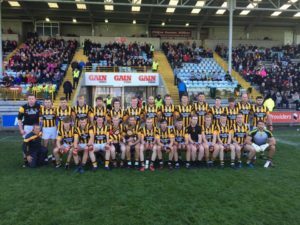 Brian’s championship outings total 43 to-date, and his 44th arrives on Saturday when Wexford GAA will be celebrating another set of footballers who shared Malone’s ambition as the heroes of 1913-1918 established Wexford as the historic first-ever All-Ireland senior football four-in-a-row winners between 1915 to 1918. Wexford will be sporting the jersey from that glory-laden era when they go into combat with newly-crowned Division 4 champions Laois, and Brian Malone can be backed to repay the privilege of wearing that special jersey with another contribution of high quality as he closes in on the stratospheric appearance records of Colm Morris and David Murphy.